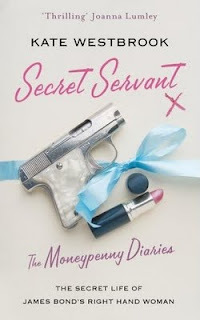 The Moneypenny Diaries series really "clicks" with Samantha Weinberg's deft second book, Secret Servant . Like espionage itself, you're not too sure where things are headed nor what information is relevant, until a startling revelation suddenly makes your vision clear and you realize EVERYTHING is relevant and danger abounds. Secret Servant reveals this series to be a single narrative, reaching all the way into the present. It also reveals it to be intricately layered, ambitious, and very very clever. Secret Servant uses a structure similar to the first book of the series, Guardian Angel . In the first half of the novel Miss Jane Moneypenny is generally an observer. This first half is tricky for the author and a little challenging for the reader as Miss Moneypenny is pretty passive. In this regard, it's very much a personal diary (Bond fans will delight in the "behind the scenes" take on Bond's assassination attempt on M). But because it's a diary there is also unique tension in how suddenly, and dramatically, the world can change in a day. In Secret Servant there are several of these dramatic entries which turn the world and the narrative on its head, including that most startling and transforming of all days, November 22, 1963, the day John F. Kennedy was killed. The second half of the book sees Miss Moneypenny thrown (convincingly) into a mission of her own (this time without James Bond by her side). Here the book assumes a more conventional thriller narrative, and a very good one at that. Unlike Guardian Angel, the mission in Secret Servant remains modest in scale (maybe because it doesn't included 007) and is much better for it. But the paired down scale still delivers plenty of Cold War suspense and some genuine Bondian action. Miss Moneypenny's hotel-room encounter with a sadistic Russian masseuse feels like something out of Fleming. What is most surprising about Secret Servant, and what makes it the better of the two Moneypenny novels IMO, is the emergence of a contemporary story-line involving the consequences to fictional author Kate Westbrook (niece of Miss Moneypenny) over the publication of the first book. The real author, Samantha Weinberg, very cleverly interweaves the adventures of "Kate" throughout the novel, creating a parallel story -- a parallel diary of sorts -- which eventually ties into the story of Miss Moneypenny and provides the most intriguing springboard for the third book. It's also fun to ride the shift in tones between Miss Moneypenny's formal and domestic writing style and the more modern, independent style of Kate. Their voices and points of view define their worlds as clearly as the subtle change in font. Unlike the first book, James Bond is largely absent for Secret Servant. That's okay. He's not missed. In Secret Servant, Miss Moneypenny and "Kate Westbrook" confidently assume front and center of this series, hurtling along with the reader toward an exciting (and possibly tragic?) climax in volume 3 -- which cannot come soon enough for this reader.